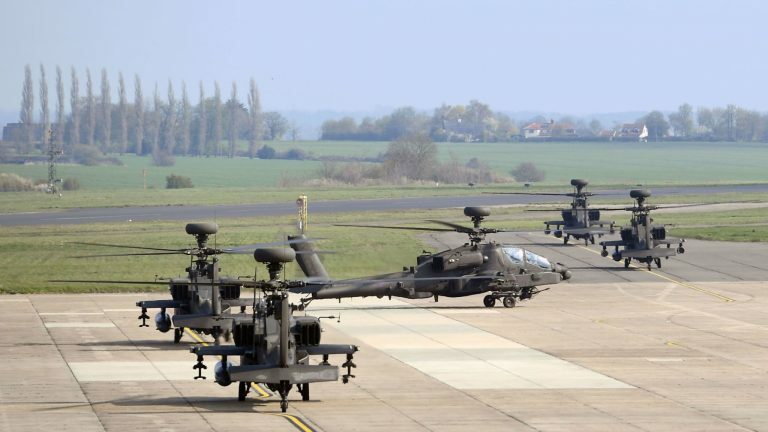 The UK has sent five Apache attack helicopters to Estonia as a deterrent to “a very credible threat” from Russia. The Apaches will be stationed in the country, which borders Russia to the east and Latvia to the south, for three months and Mr Williamson said their deployment was “really vital”. He said: “It’s a very credible threat that we see from Russia and part of the reason that we’re deploying five Apache attack helicopters is making sure that we’re constantly adapting to a changing situation. “But this is about deterrents. This is about NATO nations standing together in unity as one and you see Great Britain playing the largest role in enhanced forward presence with the largest number of service personnel deployed. While in Estonia, the Apaches will take part in training exercises across the Baltic states – including Exercise Iron Wolf, involving 14 nations in Lithuania. Major David Lambert, commanding officer of 663 Squadron, 3 Regiment Army Air Corps, said: “Whenever you go somewhere new, there’s always things that you learn about how to operate. Gavin Williamson is an idiot. Whoever put him in charge of Defense needs their head examined. If he thinks five helicopters could deter any Russian attack (not that they could really be bothered.) he is delusional. Britain is becoming a laughing stock across the world for its delusions of grandeur. I saw 5 of these flying in formation over Central London yesterday heading West to East. I agree with John above. Gavin Williamson is a useful idiot. the question is, who is directing him? US and UK wants a big war with Russia and China. With Silk Road 2 these naval powers are finished. How many more times can Putin resist the provocations? Putin plays for time, the West is running out of time. When I say West I mean US, UK, Canada, Australia, New Zealand, France, Israel & I’ll throw in Japan. Quote: The UK has sent five Apache attack helicopters to Estonia as a deterrent to “a very credible threat” from Russia. OMG !! At receiving that news, now Vladimir Putin is cowering in a foetus position under his desk in the Kremlin ?? How could you poms, frighten like that Russia & Vladimir Putin ?? I’d say the “credible threat” is loading up a bunch of attack helicopters on the border of a country that has not been demonstrating any hostile behavior. The utter shamelessness and hypocrisy of the Zio-occupied UK and US knows no bounds.